Jerusalem District Court moves salary talks behind the strike forward, freezes debt until crisis can be resolved. The Jerusalem District Court issued a 90-day stay of proceedings for the Hadassah hospitals on Tuesday. During the period, creditors may not take legal actions against the facilities, whose debts total 1.3 billion shekel (over 284 million dollars). The court also approved a financing deal between the hospital and the state that will allow at least partial payment of salaries, and appointed two trustees for the purpose of formulating a financial recovery agreement. They were ordered to immediately settle the issue of insurance for the employees in order to allow the hospitals to continue to function. An updated policy was being examined to see if it was sufficient. In addition, the court has assigned two attorneys, Lipa Meir and Asher Axelrod, to oversee that the court orders are being adhered to during the 90-day freeze. The order comes after politicians have accused the Hadassah hospital administration of being responsible for the debt due to mismanagement. This is the eighth day of the hospital strike thus far. 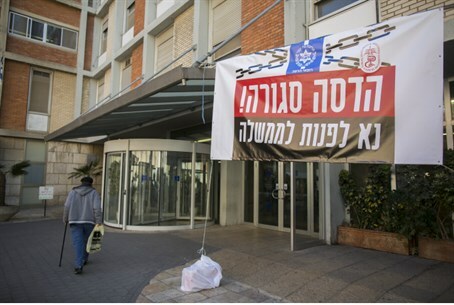 The ongoing strike at Hadassah Medical Center in Jerusalem has already driven several senior members of both Hadassah Ein Kerem and Hadassah Mount Scopus to quit, fed up over the hospital's inability to compensate for missing wages and frustrated over the tedious negotiations. The strike began Tuesday at both Hadassah Ein-Kerem and Hadassah Mount Scopus medical centers, as a backlash against the Finance Ministry for allegedly stalling in negotiations to expand the hospital's budget. The budget cuts have been hurting patients, according to staff who are reeling after a month on half-pay. As a result, the centers decided to close their doors Tuesday, operating on the schedule normally reserved for Shabbat and holidays.